Maui's natural beauty is the result of its explosive creation. Millions of years ago it emerged from the sea when volcanic eruptions formed two separate islands. These islands were joined when the enormous lava flow from Haleakala filled the gap between the two volcanoes. When the eruptions ceased and the volcanoes went dormant, Maui was left with rich, red soil for growing sugar cane and pineapple, a landscape that varied wildly from palm fringed, golden sand beaches, to the mammoth reaches of Haleakala's 10,023 foot summit and its enormous, moon-like crater, to the vertical forest, drop-dead gorgeous waterfalls and rugged sea cliffs in the mystical district of Hana. A big chunk of that natural beauty was preserved for all time when the federal government came aboard to create the nearly 30,000 acre Haleakala National Park. The legacy of the volcanoes was matched only by the ocean with its bottomless mystery, its teeming reefs, soothing trade winds, dancing surf, dolphins, whales and warm temperatures, ranging from 70 to 80 degrees F. - slightly cooler than on land. Maui County is designated as a National Marine Sanctuary, because it is home to endangered species such as the humpback whale and green sea turtles. The large landmass on the eastern portion of Maui was created by majestic Haleakala (house of the sun), the 10,023-foot dormant volcano at its center. Haleakala is popular with hikers and sightseers. This larger landmass is called East Maui. Locals often refer to any area on this side of the island that is elevated as Upcountry. Upcountry communities of Makawao, Pukalani, Kula and Ulupalakua each have their own unique attraction and charm. The sunny and dry leeward South Shore includes busy Kihei town, Wailea, and Makena. Windward towards the Central Valley is Spreckelsville, with beautiful beach areas, and Paia where surfing and windsurfing are International-class activities. The whole eastern side of East Maui is a lush tropical rainforest of bamboo and other jungle flora. Here, the road to the small village of Hana twists and turns for miles along the coast. It is well worth the time to explore the sites on this road. Many small villages, breathtaking coastal views, verdant greenery, and tidy little taro farms from yesteryear will delight your senses and provide some of your most vivid memories of Maui. Be prepared to spend most of the day going to and from Hana. The road is narrow, winding and slow going. Central Maui, between East and West Maui, is given over to cane fields. The sister cities of Kahului and Wailuku are located here, as well as the island’s economic and governmental offices. Movie theaters, several shopping centers, and all types of goods and services can be found here. There is a Wal-Mart, Costco, Big-K, Lowe's and a Home Depot close to the airport. Three smaller islands are visible from the western flanks of Maui, roughly from north to south: Molokai, Lanai, and Kahoolawe. The County of Maui is comprised of these three islands and Maui proper. 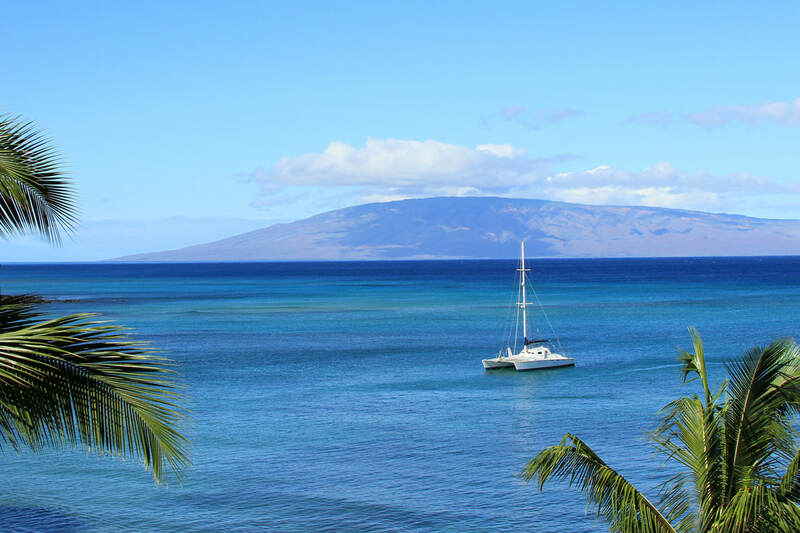 Lanai and Molokai each have towns and lodgings available and are readily accessible by ferry or small aircraft. Due to years as a military practice target Kahoolawe is now in the process of being cleaned of unexploded ordinance and replanted with native flora. Maui is a tropical island with a fairly mild year-round climate tempered by the Pacific Ocean. At sea level the average afternoon winter temperature is around 78°F/23°C during the coldest months of December and January. August and September are the hottest summer months with average temperatures in the mid 80s. Like most volcanic tropical islands, however, many different micro-climates mean packing for a variety of conditions: swim suits and light hot-weather clothing for the beaches, a lightweight windbreaker for the occasional shower at higher elevations, and more serious protection during inclement conditions when hiking Haleakala. Dress is usually quite casual. Sports clothing or beachwear is appropriate for almost all daily activities. If you plan to do anything at higher elevations, like enjoying one of the 20-mile-long bicycle runs down Haleakala or hiking the crater, use layers and be prepared for rain or drizzle. Tropical weight evening attire (casual) will be OK for all but the fanciest nightspots. Due to the prevailing trade winds, most rainfall hits the north- or northeast-facing shores, leaving the south and southwest sections relatively dry. As you make your way to various sections of Maui it is interesting to note the differences in terrain brought about by rainfall differentials. Besides the trade winds, elevation also plays a role in determining an area’s micro-climate. You will encounter everything from barren lunar-like desert with cactus bunch grass to lush tropical creepers and wild ginger to a bamboo forest to stands of eucalyptus and pines. Hawaii is one of the world’s safer tourist destinations, but all travelers should be aware of just a few basic cautions. As usual, common sense and a not allowing yourself to become careless are the two most important attributes the seasoned traveler can possess. Always bring along plenty of sunscreen and water, as well as sunglasses for eye protection and a hat or cap to keep the sun off your head. The tropical sun can be quite intense, especially if you are not used to it. Always lock your rental car. Stash all bags and gear in the trunk or better yet take all valuables with you or leave them behind before the day’s excursion. Treat the ocean with respect. Don’t overly challenge your abilities as a surfer, swimmer, kayaker, or other water enthusiast. Heed all warning signs on beaches about water conditions. Calm surface waters often mask strong currents and hidden reefs. While on the beach it is always a good idea to keep your valuables out of the sun & out-of-sight. If you can get to know a neighbor on the beach, so they/you can watch your stuff while you stroll the beach or go for a snorkel. Many ocean creatures are dangerous because of either their aggression or their toxicity. Give sharks, eels, jellyfish, and whales plenty of room. Treat the backcountry with respect. It may look like a tropical paradise where nothing remotely threatening can go wrong. But it sometimes does go quite wrong for the careless. Exposure, climbing accidents, dehydration, and disorientation are all very real dangers. Stay on marked trails when hiking to preserve local flora and fauna and to avoid difficulties with illegal marijuana growers. Keep your condominium or hotel room locked and valuables put away. Use discretion when venturing out at night. Be sensitive to “local” hangouts where outsiders may not be as welcome.